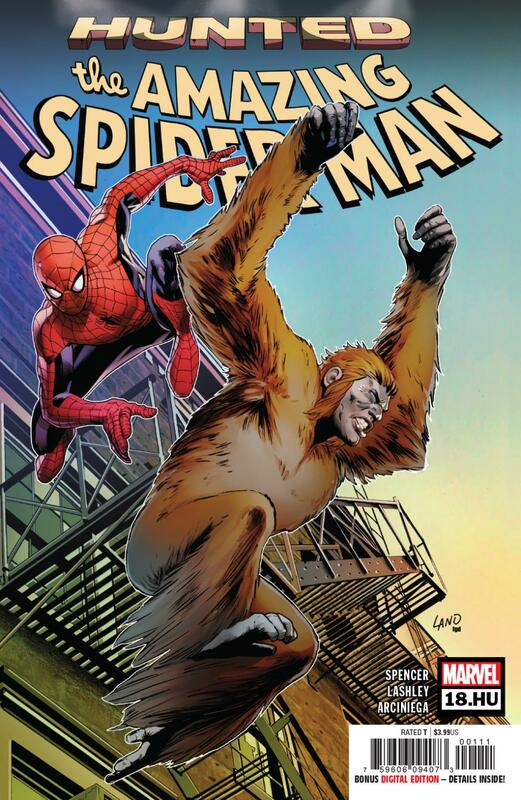 What, you weren’t all that jazzed about an issue of Spider-Man starring Gibbon? Me neither, but we should have been! If anyone had doubt that these HU issues would really be worth anything extra, that doubt will surely be gone by now. Black Cat’s was entertaining and introspective, and 18.HU doesn’t let up. To me, this feels more important than the last issue of Amazing. I’ll be the first to admit I’m not too familiar with the Gibbon. If you’re in that boat with me, worry not. This issue takes plenty of time to give us everything we need to know, and thankfully, it’s not in some abrupt exposition dump. There are flashbacks interspersed throughout Marty’s inner monologuing in a way that feels totally organic and works with the pacing rather than against it. So, on the other hand, if you’re already up to speed on everything there is to know about the Gibbon, you won’t be bored with this issue telling everything you already knew. This bonus chapter of “Hunted” really should be required reading, anyhow. While last issue of Amazing Spider-Man left me wanting, this one is emotional and features a relatively important death. It gives you everything you need in order to care about the Gibbon’s attempted escape and in turn, gives “Hunted” as a whole a clearer picture. Ken Lashley’s art is a tough act to follow for anyone else on this story. It’s a little jarring (not to this book’s detriment) going from Ramos’s sketchy, amorphous characters to something so clean cut. The action is easy to follow but still gives us interesting perspectives that make otherwise by-the-numbers shooting exciting. His faces and body language are probably the best part, giving everyone a unique look and clear vocalization without being over the top. Similarly, Erick Arciniega’s colors lend themselves excellently to vocalizing the tones of a given scene, be they loneliness, suffocation, nostalgia, what have you. The lighting is no different. The moon shining on a hunter’s head, the red flash of impact and its pain. All these serve to empower the stakes both physical and emotional, and they do their job very well.